Yes, that’s a real screenshot; I just took it a few minutes ago. No, I didn’t Photoshop it — that’s really what it said. And, yes, looking outside my window right now, it’s snowing. In April. Believe it. 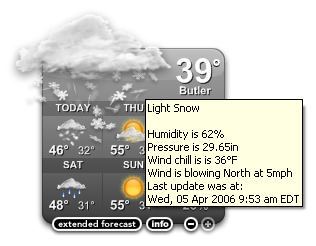 Update: It snowed again, on April 5th, 2007, too. King Solomon said,”There is nothing new under the sun”. If you see the snow in July, don’t be surprised.